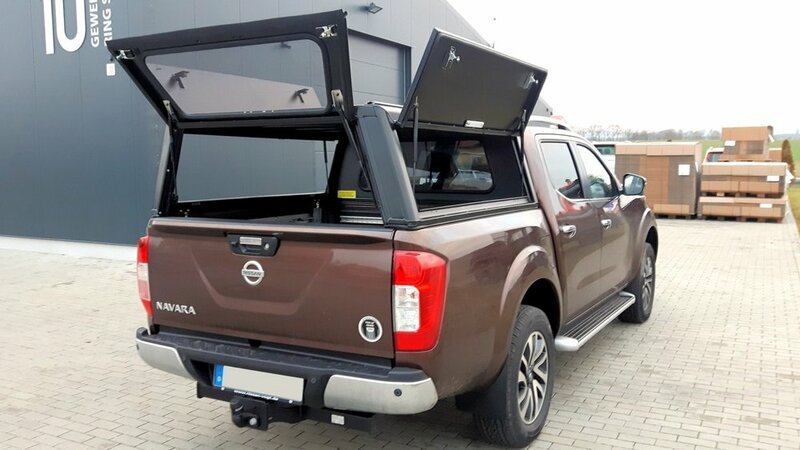 Heavy duty canopies from Alu-Cab are highly regarded as being one of the most unique vehicle accessories in the market. They are almost completely manufactured from aluminium, so they are durable, and UV- and corrosion-resistant. The Aluminium frame, despite its’ light weight, ensures extreme stability which allows cargo to be loaded on the roof. Thanks to cargo rails, interior fittings can be simply, stably and reliably attached to the frame. Cargo rails on the roof enable simple installation of cross-beams and roof rails. Large side doors allow for easy access to the loading area. Optional storage or sliding rails allow for organisational order, and accessibility from the outside. With a large selection of accessories, your canopy can be adapted to fit all of your needs. 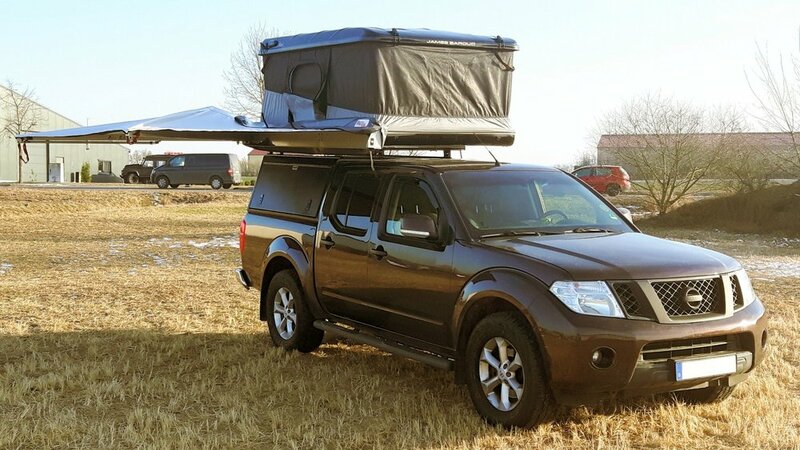 Alu-Cab manufactures overlanding equipment and accessories such as tents, awnings, drawer systems and rooftop conversions, to name a few. Supplying the Safari Rental fleets has proven to be the best testing ground an off-road accessory manufacturer could hope for. These vehicles spend their whole lives on roads that are much worse than what is found here in Europe. It is the use of Alu-Cab products in these rental fleets that is responsible for the outstanding reputation of Alu-Cab products in Africa. The front ventilation openings shown in the above pictures are not included in the scope of delivery and cannot be retrofitted. We recommend a front sliding window for ventilation. 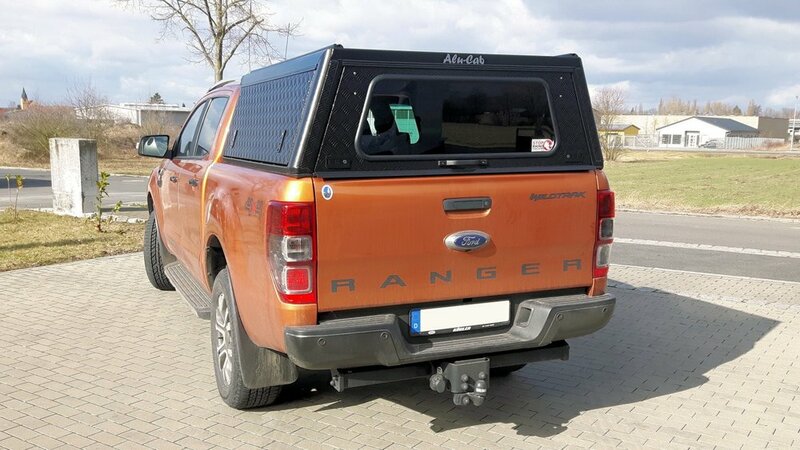 Alu-Cab, along with Genesis Import GmbH, has developed the third generation of the Explorer Canopy. This newest generation of Aluminium canopies was re-conceptualised and many details have been improved. For example, built-in cargo rails and doors were updated to include flush hinges for better functionality. 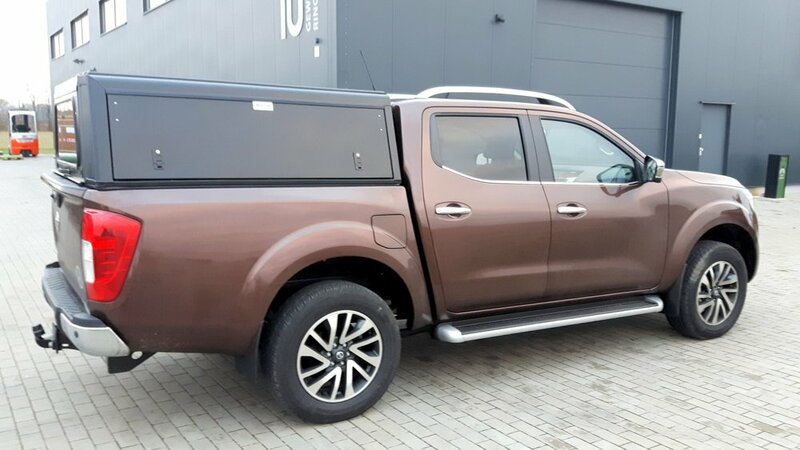 The dimensions of the hardtops are adapted to the height of the cabin and are equipped with two large side doors and a tailgate. The Explorer model has a full-width tailgate, while the Adventure model has space to the left and right of the tailgate for mounting a ladder, canister or gas bottle holder. A large safety glass window is located on the front and rear sides. An LED light strip is pre-installed for lighting the interior. Two Cargo rails on the roof are used for easy mounting of roof racks or for securing loads. 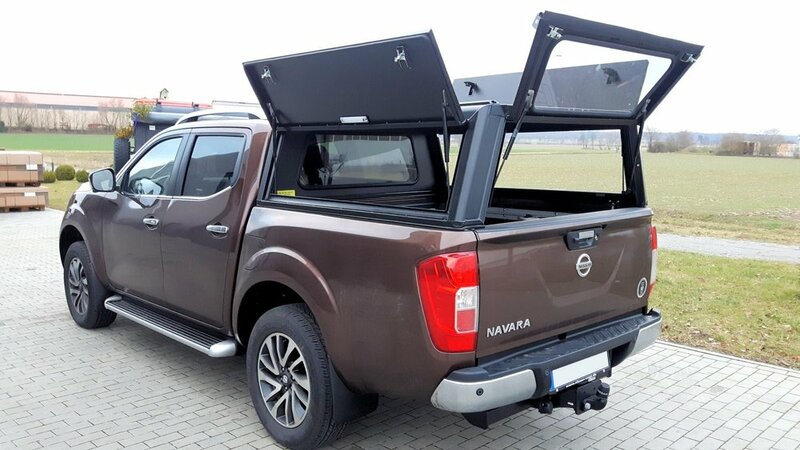 Explorer Canopy with large tailgate and flaps in smooth surface standard design. 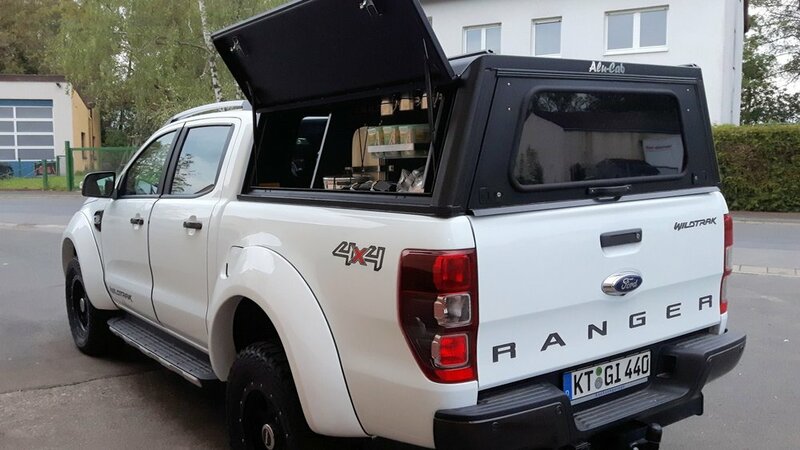 Adventure canopy with small tailgate and mounting options for accessories as well as optional flaps in checker plate. Mounting the canopy is done by vehicle-specific brackets on the truck itself, without needing to drill onto the vehicle. The canopy has been completely powder-coated, and is available in silver-grey and black. As an option, the canopy is also available in black with silver-grey side flaps, and in silver-grey with black side flaps. 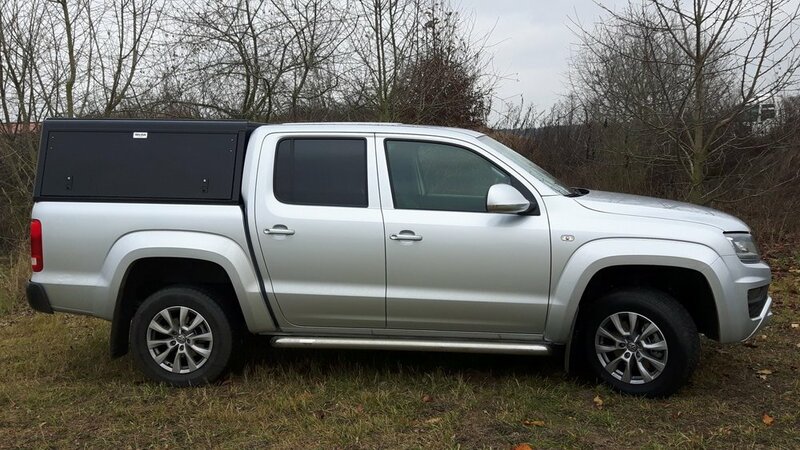 The double-cab canopy weighs approximately 57kg. The Canopy for an extra cab weighs approx. 68kg. Comparable steel canopies weigh about 50% more, and fibreglass canopies are even heavier, in some cases, and have significantly reduced stability. The canopy frame is made of 2mm-thick Aluminium and WIG-welded Aluminium extrusions. The roof is a 1.5mm thick Aluminium ribbed plate and is supported by Aluminium profiles 25 x 25 x 2mm which are approximately 30cm apart. Due to the stability of these fasteners, the roof can normally carry around 400kg off-road or on rough terrain. The tread plate reduces the chances of your cargo sliding around. Based on the extraordinarily stable construction of the Aluminium profiles, additions such as cabinets, shelves or mounting rails can be secured directly onto the frame. For this reason, the lower longitudinal frame member, front-lower transverse member, and the roof transverse members are all made of Aluminium profiles with integrated nut slots. Therefore, commercially available hex bolts (8mm) can be used. The vehicle brackets are also screwed to these rails. The cargo rails on the roof do not need special screws or T-nuts. Here, standard M8 flatbolts with square head (DIN 603) should be used. In both cases, a stable connection can be achieved by using lock nut screws (DIN 985). It is also possible to mount equipment to the roof or side of the vehicle, but you should ensure that your cargo is properly protected from rain and water. The side and rear doors are made of smooth, powder-coated and multi-folded Aluminium plates 1.5mm thick. They are secured with external, continuous rubber hinges. So, even with the flaps open, no water can come in from above. Two gas-pressure springs aid the opening and keep them in the open position. In the Canopy Explorer, the rear door covers the full width. 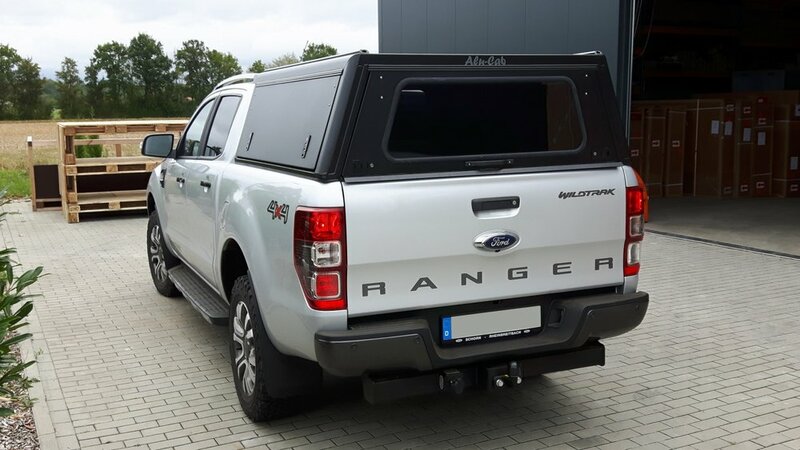 In the Adventure model the tailgate is only 90cm long and there is space on both sides of the flap for mounting a rear ladder, canister or gas bottle holder, for example. In the double cab the side flaps go over the full length of the canopy, the extra and single cab, as well as the high canopies for the Land Rover Defender and Toyota HZJ79/GRJ79, a stiffening plate is welded onto the flatbed. Two black, powder-coated and sealed, flush push button locks keep the flaps secure. A handle on the tailgate opens the door. All levers can be locked. One key fits all locks on the canopy. Upon request, the doors are also available in durable tread plate aluminium. There is a large window made of e-approved safety glass at the front of the canopy. Depending on how the truck is loaded, traffic behind the vehicle can be seen from the interior mirror. Instead of a fixed window at the front, a sliding window is also available to ensure adequate ventilation, which is especially important when transporting animals in the canopy. The sliding window can also be retrofitted. The side doors are also available as an option with sliding windows made of safety glass, either on one or both sides. Upon request, the canopy is also available without front and rear windows. The roof has two mounting rails with C-profile. These can be used for attaching the roof racks and accessories. M8 flat-head screws with square head (DIN 603) can be used in the rails. It is, therefore, very easy to load with a ring eye. Mounting is carried out on almost all models by vehicle-specific brackets. These are drilled into bores for lashing straps, holding or sports bars. Only in this way can the high roof load be achieved without deforming or damaging the load bin, and there are no problems with sliding even in difficult off-road conditions. None of the Alu-Cab canopies are attached to the platform with simple brackets or clips. Drilling is not necessary for mounting onto the vehicle. After first assembly, the canopy can be removed in less than five minutes. When properly installed on the vehicle, the canopy is watertight. Please note, however, that not all load bins and pickup tailgates are 100% watertight. Upon request, the canopy can be equipped with cupboards accessible thru the side doors, 750 and 1,250mm long. These are ideal for storing tools or camping equipment. They are available with our pre-configured kitchen and mountain equipment. The side compartments are made of Aluminium and are carpeted. The cupboards are installed without drilling to the cargo rails, and can be placed to fit your needs. Available in silver-grey and black. For space-saving, a camping table or countertop can be stored directly under the roof of the canopy. It is also made of aluminium, with legs that open into position by gas-pressure springs. They are 117.5 x 75.5cm long, 77.5cm high, and weigh 7kg. A small, practical, foldable coffee table can be slide into a channel rail at the side of the canopy. Therefore, within seconds, it can provide a place for storing small things, like coffee cups, tools or camera equipment. It weighs 3.5kg and is available in silver-grey and black. In order to create storage space for Ammoboxes, sliding rails can be installed transversely into the canopy. Three Ammoboxes 50 x 40 x 23cm can be placed on the Aluminium insert. The boxes can be installed without drilling into the cargo rails. Available in black. Instead of the fixed window at the front, a sliding window is also available to ensure adequate ventilation when transporting animals in the canopy. The safety-glass sliding window with E-approval can also be retrofitted. The side doors are also available with sliding windows made of safety glass with E-approval, on one or both sides. The sliding window can also be retrofitted. With the rear ladder for the Adventure 3, you can easily climb to the roof of the canopy. Made of Aluminium and available in silver-grey and black. An Aluminium Jerry Can or canister holder is also available to mount on the Adventure 3 canopy. Ideal for a 20 Litre water or petrol tank. Can be secured with a padlock. Available in silver-grey and black. A shaft for a 3kg gas bottle is also available for mounting on the Adventure 3 canopy. It is made of aluminium, and the clamping hanger is made of stainless steel. Available in silver-grey and black. For installation on the cargo rails on the roof, lightweight Aluminium cross-beams are available. These are fastened by means of stainless steel feet. The flat Aluminium profiles have a C-groove on the upper and lower side, as well as a longitudinal side for easy mounting of additional accessories or lashing lugs. M8 hexagon socket screws (DIN 933) can then be inserted into the grooves. The crossbeams available are 1,000mm, 1,250mm, or 1,450mm. Approx. 6kg. Available in silver-grey and black. 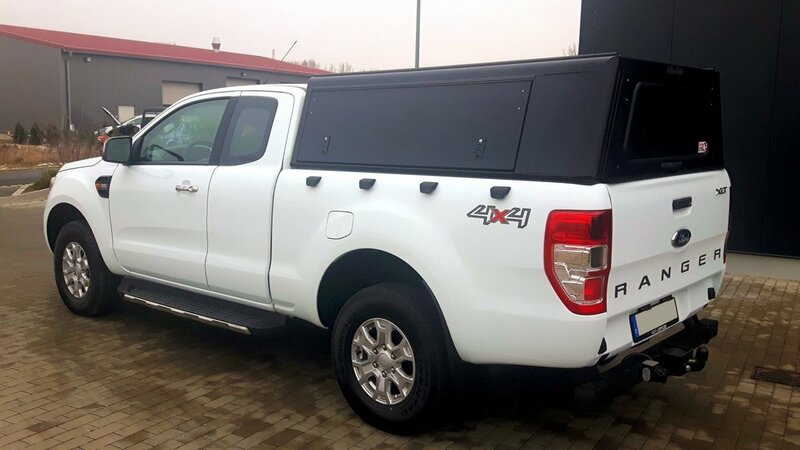 The roof rack with railings and a wind deflector is also made of Aluminium and stainless steel and is mounted on the cargo rails on the canopy roof. The C-slot of the roof rack can be fitted with standard M8 hexagon head screws (DIN 933). Approx. 8kg. Available in silver-grey and black. Lightweight Aluminium roof support 240cm long, for transporting ladders or pipes. Also suitable for water sports equipment. Available in silver-grey and black. For mounting on the loading floor, Alu-Cab offers high-load drawer systems as single or double drawer, and in three different depths. Made of aluminium, they are significantly lighter than comparable steel drawers. A tiltable cooling box slide-out unit can be mounted on the drawers. As a sun and rain protection for work and play, a large, as well as quick and easy-to-open free-hanging 270° Awning is available. 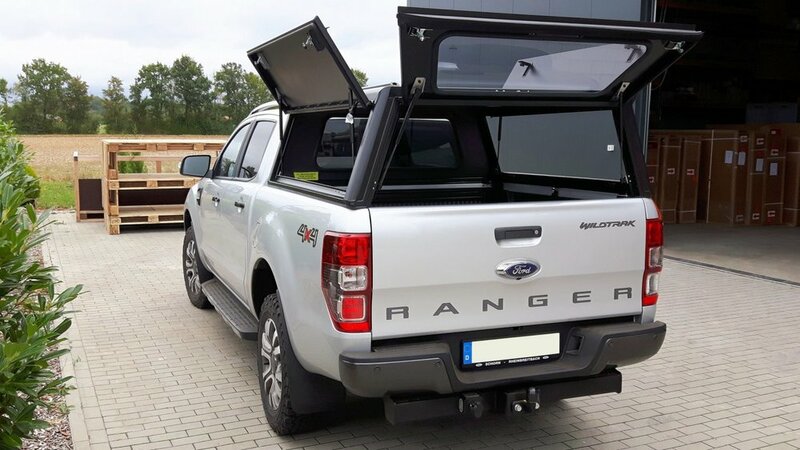 This can be mounted with special brackets on the crossbeam, the roof rack or directly on the rooftop tent and is available in two versions for the left or right side of the vehicle. With optional side walls, it can be extended to a tent. The Aluminium Rooftop-Tent Expedition 3 fits visually perfect and (thanks to special brackets) is very easy to mount on the canopy. One advantage of the very stable design of both the canopy itself and the brackets to fit the canopy to the load bin. 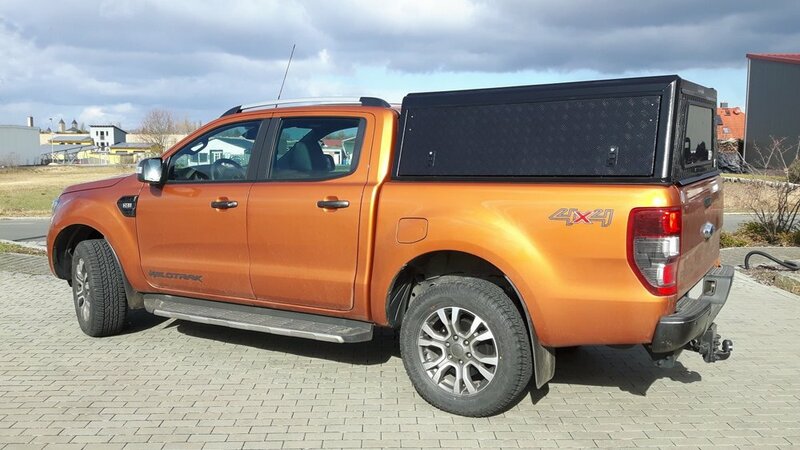 The Aluminium canopy is designed to hold heavy cargo, and unlike many plastic canopies, doesn’t need additional tools or braces when transporting cargo on the roof. 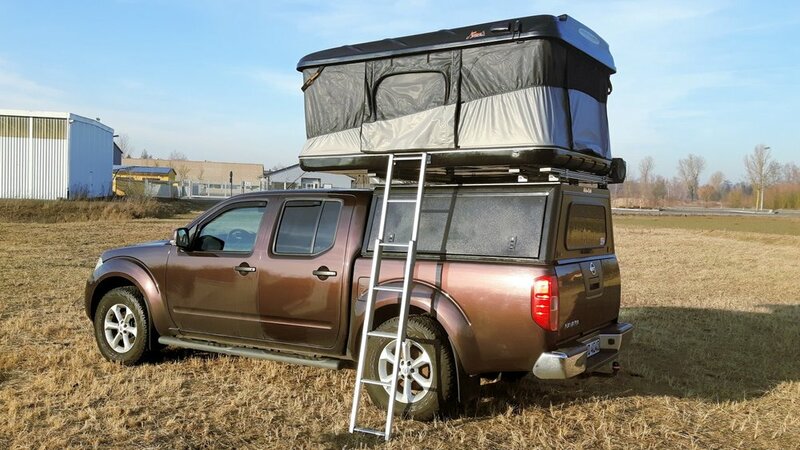 The 270° Awning can be attached directly to the rooftop tent using special brackets. 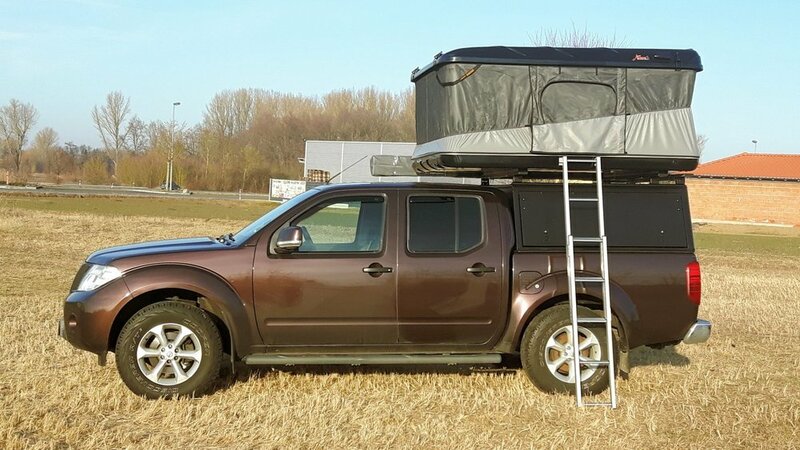 The rooftop tent is available in silver-grey and black. The hardtops are available in silver-grey and black as standard. On special order also in silver-grey with black frame and in black with silver-grey frame. Common models are available from our Warehouse in Germany.